I know many people that say EPCOT can be boring and very little every changes in the World Showcase. I think this could not be further from the truth. 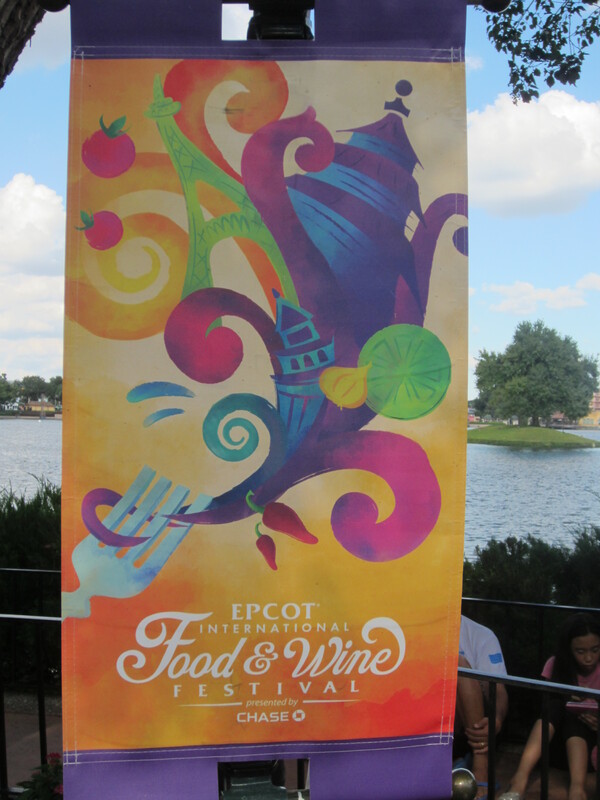 The landscape and gardens change with the seasons and World Showcase host one of the best events of the Disney year, the Epcot® International Food & Wine Festival Presented by Chase®. This event lets you bring your palate for a memorable trip through the eclectic cultures of the world and the food that makes each one special. Everything from Greek food to American cheeses burgers. All sorts of special events, cooking demos and parties make the 19th annual Epcot International Food & Wine Festival worth the trip, but for us, it’s the simple pleasure of noshing and sipping our way around World Showcase that is was the most memorable parts of the 53-day festival that debuted Friday, September 19, and ran through November 10. Lobster Alfredo at the Hops & Barley Marketplace, a bowl with warm macaroni noodles, generous bits of lobster and a crunch topping. Add a 6-ounce pour of crisp Samuel Adams Cherry Wheat. Eat dessert first: you don’t want to miss the rich, velvety caramel crème brûlée with fleur de sel at the France Marketplace. Pair it with a flute of Sparkling Pomegranate Kir. A hearty, healthful dish is Patagonia’s Verlasso salmon, served with quinoa salad and a flourish of garlicky arugula chimichurri. Add a pour of the fruity Cono Sur Bicicleta Viognier. At the Farm Fresh Marketplace, there’s the perfect taste of Southern comfort food: griddled “Yard Bird” (chicken thigh) with collards and a dollop of the house-made habanero sauce. Just for fun, add a Florida wine (yes, Florida), the Key Limen-Key Lime Wine from Florida Orange Groves. Also at Farm Fresh, the Florida grass-fed beef slider with a scoop of kicky pimento cheese melting over the warm burger was another don’t-miss. We added the Beer Flight (four 4-ounce servings): I-4 IPA, Ba Ba Black Lager, Duke’s Cold Nose Brown Ale and Florida Cracker Belgian Style White Ale. Even if the idea of snails is not for you, give it a try. They’ve jazzed up the escargot in France, now served with three tender snails in pastry with lots of garlic, spinach, bacon and Parmesan. Be elegant and pair with a cool Chardonnay, Macon-Villages, La Côte Blanche. For a taste of the tropics, it’s the Ensalada de Carrucho, Caribbean conch salad with onion, tomato and cilantro at the new Puerto Rico Marketplace along the Rose Walk leading to World Showcase Plaza. Pair it with Medalla light beer. Canada’s Seared Rainbow Trout with Bacon, Frisee and Maple Minus 8 Vinaigrette deserves a pour of the Canada Mission Hill Family Estate Syrah. Desserts & Champagne Marketplace is always our final stop, and we can recommend this year’s trio: Passion Fruit Coconut Creamsicle, Blueberry Lime Cheesecake Roll and Chocolate Espresso Opera Cake. Best of all, they’re now serving Dom Pérignon Champagne. Life is good. After this year fully intend on planning all of my future trips to the Walt Disney World Resort during the Food and wine Festival.